It all started with a trip to Ghana. Shawna Sanches and her husband were in the final stages of adopting a little girl from West Africa. Instead of waiting in the United States during the typical three-month period of paperwork, the Sanches family decided to stay in Ghana to be with their new daughter. This family, with their four children and a newly adjusting toddler, had quite the adventure. Even the walk to a nearby town was eye-opening, as Shawna’s oldest daughter, Melody, noticed how many girls walked several miles each day for clean water. After the family returned to the United States with their new daughter, Olivia, Shawna and her husband, Louis, encouraged her older children not to forget what they had learned in Ghana. And they did not forget – after witnessing how many people in Ghana go without basic supplies, the Sanches family knew they needed to make an impact. Not long after their trip, Shawna’s adoption caseworker mentioned that she had recently read a book that she thought Shawna would enjoy. The book was Jantsen’s Gift, written by Touch A Life co-founder Pam Cope. While reading it, Shawna was shocked by the account of child slavery on Lake Volta in Ghana. Her family had seen these children fishing on the lake and had assumed that they were working with their fathers and uncles in the family business, not that their families had sold them to a slave master. That night Shawna sat down with her children to tell them about what she had learned. Her children were stunned by the news, and then decided they should take action. The family knew that their passion was for clean water, so they reached out to the Touch A Life Foundation and offered to raise funds for a new well on the Care Center property, which would help to achieve two goals: one of getting clean water in Ghana and another of helping formerly trafficked children. Inspired by the long treks for water made by locals in Ghana, the Sanches family held a Water Walk 5K event in their hometown of Tulsa, OK, in order to raise the $10,000 needed to drill and maintain a new well and pump in Ghana. 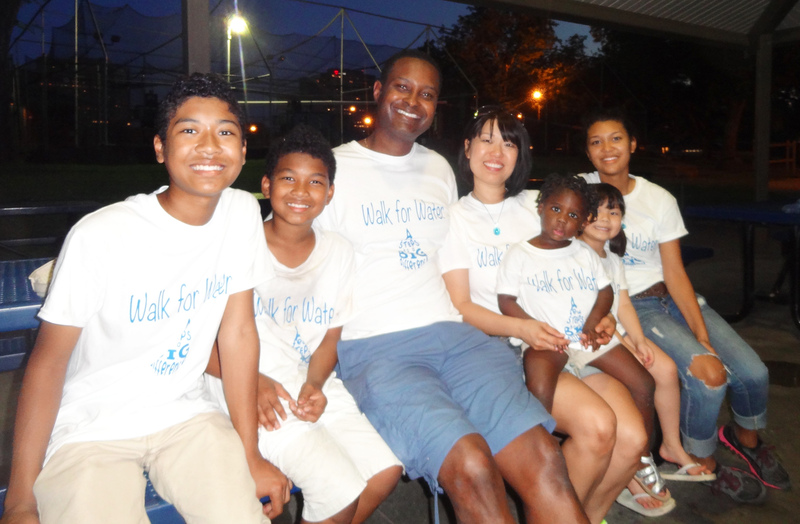 The Water Walk took place on August 17th at a local park with a walking path. Each walker had the opportunity to walk the course while carrying a 5-gallon bucket filled with water – six walkers were able to carry the water for the entire 5K. At the midway point, Shawna placed signs for the walkers that said “If you were in Ghana, you’d only be halfway to your water…dirty water.” Many participants shared stories of how their perspective about access to clean water had been changed, and after the event, Melody told her family that she was going to devote her life to serving people abroad. Shawna and her family worked to engage local companies as sponsors, including Home Depot and Lowes, who donated the 5-gallon buckets. The event alone raised over $7,900 and the Sanches family is working on raising the remaining funds through their 501c3 organization, The Precious Child Foundation. The Touch A Life team is looking forward to drilling this new well on the Care Center property. The well will supply clean water to the Care Center as well as to a future aquaponics project on the property. It will also be accessible to the surrounding community. With 80% of diseases in Ghana stemming from contaminated water, this project is critical to sustainable care. The Sanches family and their supporters are making this project possible, and they plan to raise the funds for more clean water wells in the future. If you are interested in donating toward our clean water project, or spearheading your own Touch A Life fundraiser, please contact us – we’d love to talk to you! It is actually really a great along with valuable bit of info. I am grateful that you just contributed this beneficial information here. You need to keep us educated like that. Thank you for spreading.